parts are still available through the link below. 7 1/2' 29" 12 3 8 1 1/2"x12" 6' 7" 630 lb. Standard 3/8" x 6" or 1/2" x 6"
8' 29" 11 4 8 1 1/2"x12" 7' 1" 717 lb. Standard 1/2" x 6"
8 1/2' 29" 11 4 8 1 1/2"x12" 7' 6" 731 lb. Standard 1/2" x 6"
9' 29" 11 4 8 1 1/2"x12" 7' 11" 745 lb. Standard 1/2" x 6"
Plowing snow for a living is one of the toughest businesses you can be in. The snowplow you choose must be storng enough to take a real beating. You can't go up against brutal winter weather with unproven lightweight equipment. Built for the business of snowplowing, the rugged Fisher HD Series plows will withstand the rigors of any and all commercial applications. 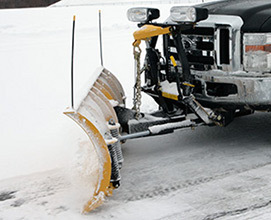 These popular 7'6", 8', 8'6" and 9' plows are the choice of the plowing professional. Designed for 3/4 and 1 ton four-wheel drive trucks, as well as today's new 15,000 GVW "Super Duty" vehicles, these blades are 29" high and built with heavy 11 gauge steel. The trip-edge is backed with 2 reinforced wear bars at the bottom to increase wear resistance. With the chain lift system, you get instantaneous “float” when lowering the blade. Unrestricted, the blade can freely follow the contours of the plowing surface for a cleaner scrape. With the chain lift you can stack higher because you’re not limited by the hydraulic ram \stroke, unlike cylinder lift systems, which can only pull the plow up as far as the limits of the cylinder’s range. In the rare event of a hydraulic failure, you can push the plow up into a snow bank and “short chain” the plow by attaching it to the specially designed bracket and safely transport the plow back to the shop. The simplest and most trouble-free attachment system available. 100% mechanical design means there are no electrical components or hydraulic assist gimmicks to fail. 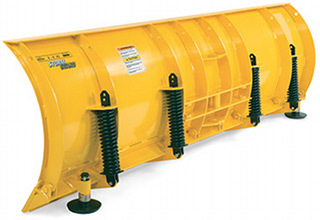 The attachment arms and lower gear are flared both vertically and horizontally to make the drive-in connection easy. Accessories include a steel cutting edge made of 1084 high carbon steel to improve cutting power and scraping ability, the Fisher SnoFoil to funnel snow to the side, curb shoes and a plow parka which fits over the lights and headgear for protection from the elements. A steel or 2-ply rubber deflector is also available to help keep snow off your windshield.